This can take the form of a button, designed to suit your website, or our preferred calendar app/widget. An example of this can be seen to the right... please play with this to get an idea of how user friendly and intuitive the system is. This demo is set to force weekend bookings(fri,sat) to be a minimum of 2 nights and slightly more expensive! All of this, is configurable by you including seasonal settings/prices, bank holidays (treated annually) as well as your specific date/price requirements. Simple to use 'click 2 mark' and then close/book/move/delete easily. Standard/Advanced Key to allow you to manage as you prefer. expedia.com and many more. Please see our Partners page. Click any date to see who is checking in or out on that date. 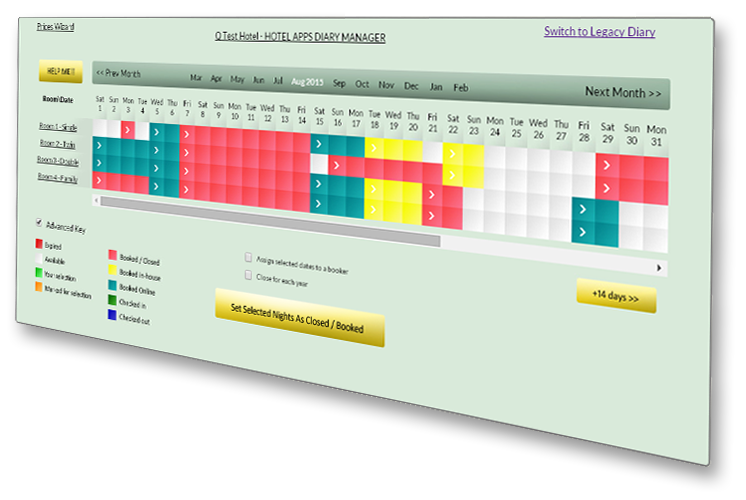 Prices Wizard to allow you to easily manage seasonal, weekend or bank holiday prices and rules. 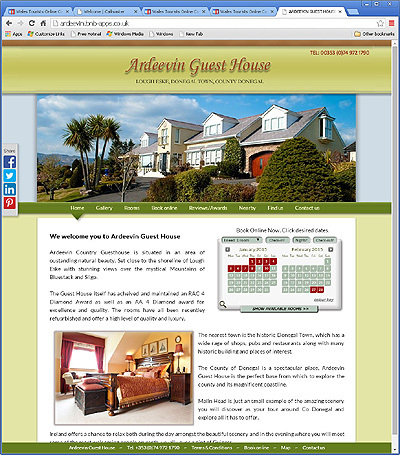 This is a live website example produced using one of our templates. You will also be provided with a login area for Content Management (CMS), a free .co.uk domain of your choice subject to availability and free web hosting plus 3 email accounts. We are contantly updating our website systems, to update social media access and the latest SEO (Search Engine Optimisation) techniques, for example, all of which will be offered for free when available, rather than charging for upgrades. You will have full ownership rights over the new domain name, if registered by us, for which there will be no charge while using our free hosting services, otherwise there will be a £50 admin fee to transfer to another service provider. We believe this will be unlikely, but hope this shows that we are not trying to tie you in to any terms with us, unlike other companies, should you choose to terminate our agreement. We have other innovative features and facilities that we are confident will be of benefit to you, but which we are not making public at the moment! Please contact us using our 'Contact Us' page for more information.